Taken as a whole, the music of Wolfgang Amadeus Mozart (1756-1791) remains one of European classical music’s most indestructible pantheons. Among the many symphonies, operas, songs, and chamber pieces in his formidable oeuvre of over 600 works is a handful (at least in Mozartian terms) of twenty-seven piano concertos. Theatrical, eclectic, and epic in scope, the concertos are the epitome of instrumental music written in the eye of an operatic storm. Their dramaturgy is put on full display in these two stunning double-albums from Keith Jarrett and the Stuttgart Chamber Orchestra under the baton of Dennis Russell Davies. The selections therein were approached improvisationally—that is, Davies never knew exactly what Jarrett was going to do, and vice versa. The end result is warm, spontaneous music-making that tickles the ears and invigorates the soul. 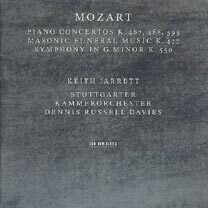 The first set, released in 1996, instituted a major breakthrough in Jarrett’s classical career. If no one had taken him seriously with his ECM recording of the Shostakovich 24 Preludes and Fugues, then certainly he was turning a few heads now. From the moment he lays his fingers upon the keys, Jarrett transports us—and himself, I imagine—to a spacious and familiar world of sound, and in the company of such a finely tuned and responsive orchestra his pianism soars to new heights. This concerto moves in sweeping gestures, spreading its arms over grand vistas, secret gardens, and mazes from which one never wishes to escape. The Allegro is sprinkled with moments of colorful synchronicity in which the piano doubles the flutes, further underlining the symbiotic relationship between the soloist and the landscape he inhabits (this doubling is later picked up by strings for an even broader sense of cohesion). The Adagio pulls away its own skin to expose an arduous inner conflict before trusting its resolution to the pianist’s capable hands. An ever-changing ensemble pairs the piano with different combinations of winds, all “strung” together by the orchestral whole of the infectious final movement. The wind writing is superb throughout and provides some of the concerto’s most insightful moments. Mozart’s final piano concerto opens on a playful note, swinging its way confidently through the branches of a singular musical path. The piano solos glow like childhood, which is to say they are entirely without fear. The central Larghetto begins with a light solo before French horns signal the orchestra to follow, weaving a solitary song. Only then do the piano and orchestra find each other after what feels like eons of separation. The Allegro begins again with piano alone, and as the orchestra picks up the theme in a grandiose call-and-response we find ourselves bathed in a scintillating resolve. The many solo moments injected into the final passage make for a provocative finish. Masonic Funeral Music K.477 (1785) was written for two of the composer’s Masonic brethren, though sources suggest the piece was more indicative of the Society’s ideological spirit than it was of its dedicatees’ service to it. Nevertheless, its minor shifts and mellifluous wind writing make it an elegant experience all the same. The Concerto for Piano and Orchestra No. 21 in C Major K.467 (1785) is heavier on the strings and is distinguishable by its overtly march-like rhythms. The piano seems to act in the opening movement as a complicated ornament rather than as the focus of attention. The ubiquitously famous Andante sounds fresh and crystal clear as Jarrett carries the orchestra along its pastoral journey with a precise left hand, dropping a trail of breadcrumbs into the encroaching twilight. The virtuosic final movement is nothing short of breathtaking. The Symphony No. 40 in G Minor K.550 (1788) is one of only two Mozart symphonies in a minor key and is almost as recognizable as Beethoven’s 5th. It comes gloriously alive in this passionate performance, of which the third and fourth movements stand out for their stately precision. The second set of Jarrett/Davies Mozart collaborations, released in 1999, shows the two interpreters exploring this fine material from an even deeper point of articulation. The Concerto for Piano and Orchestra No. 20 in D Minor K.466 (1785) is the most somber of either program. Its Allegro builds a structure of monumental darkness. Ironically, the slow movement has far more energy than its predecessor, while the third is one of the masterpieces of collection, bristling with plenty of Mozart’s character-defining trills. This is an epic concerto with another gorgeous Andante and an inspiring Presto that abounds with the liveliness one would come to expect from the younger Mozart. The ninth concerto is the earliest piece of either album, written when the composer was just 21. This picturesque concerto is considered exemplary of the classical aesthetic. The opening Allegro is deceptively simple and endlessly colorful; a lush Andantino seems to yearn for an impossible love; and the final movement dutifully carries out its joyful mission, reporting back with most resplendent success. The piano concertos are so long that, on a 2-CD set, they only leave room for shorter fillers, like the humble Adagio and Fugue in C Minor K.546 (1788), one of his most “filmic” pieces. While the Bach influence is clear, there is a dramatic undertone that is distinctly Mozart’s own and which provides a fitting close to another thoughtful and finely executed album. Mozart constructed his piano concertos in such a way as to encapsulate all of the space embodied by the strings in the piano’s introductions. In this way he delved microscopically into the larger orchestral organism, revealing hidden biologies with laboratorial precision. Every movement is like a pianistic symphony in and of itself, a fully fleshed musical entity whose relationship to its neighbors is more genetic than it is formal. Davies shows a profound aptitude for the music at hand, as does Jarrett, who breathes clear diction into every phrase. Jarrett also excels in the ornamentations, especially in his many exuberant trills. This is classical music at its “grooviest” and is sure to please. Despite the epic length of the concertos, many surpassing thirty minutes, this could be a demanding listen were it not for Mozart’s continual innovation and unwavering commitment to circumstance. At any rate, the combined forces of Jarrett and Davies make even the heftiest doses easy to swallow. I find it baffling to see that what little criticism these recordings have garnered focuses solely on Jarrett’s playing, calling it mechanical and lacking in the improvisational flair one would expect from the consummate jazzman. For what it’s worth, I find his performances to be nothing less than inspired and uplifting. I should make the reader aware, however, of the recording itself, which in the first set places the piano curiously distant in relation to the orchestra, as if at the back of the hall or even in a separate room. While this positioning works more fluidly in certain movements over others, ultimately the listener’s discretion will determine whether or not it is a successful arrangement. I find that it takes some getting used to every time I put the album on, but that once I do the effect is quite haunting.